Harasewych and his team have focused on different aspects of the Cerionidae, but have now added a phylogenetic paper with state-of-the-art technique. “The complete mitochondrial genome of the neotype of Cerion incanum (Leidy, 1851) was sequenced using high-throughput sequencing and found to be a circular genome 15,117 bp in length with a GC content of 34.3%. It is the largest mitogenome presently known in Stylommatophora, with the difference in size due primarily to intergenic regions and to a lesser extent to larger sizes of individual genes. Gene content is identical to that of other stylommatophorans, but differs in having the tRNA-Gln gene situated on the major coding strand. Gene order of C. incanum was similar to that in Helicidae, differing in the regions between COX1 and NADH5, and between tRNA-Ser2 and tRNA-Ile. The potential origin of replication was located in a 50-bp noncoding region between COX3 and tRNA-Ile. Phylogenetic analyses using Bayesian inference and maximum-likelihood analyses of nucleotide data for all protein-coding and large and small ribosomal genes resulted in a well-resolved tree. This tree was similar to trees derived from nuclear or a combination of nuclear and mitochondrial genes, differing from previous phylogenetic reconstructions based on mitogenomes in the placement of Hygrophila. The phylogenetic position of Cerionidae as sister taxon to Helicoidea is consistent with previous findings after allowing for more limited taxon sampling in the mitogenome tree. The mitogenome tree is sufficiently populated to refute the inclusion of Cerionidae in Clausiloidea, as advocated by some authors, but at present lacks the representatives of the Orthalicoidea or Urocoptoidea needed to resolve more precisely its relationships with those taxa”. The last sentence of their abstract is intriguing, and in Leiden we had hoped to be able to contribute to this knowledge by supplying data from a Bulimulus and a Drymaeus species. However, the PCRs have failed and the project has been dropped. González, V.L., Kayal, E., Halloran, M., Shresta, Y. & Harasewych, M.G., 2016. 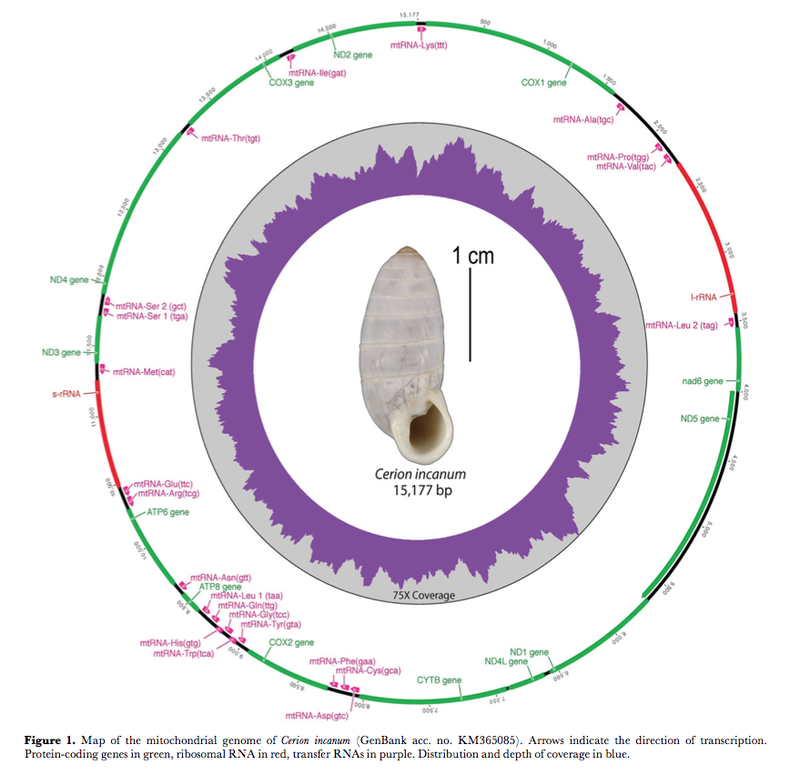 The complete mitichondrial genome of the land snail Cerion incanum (Gastropoda; Stylommatophora) and the phylogenetic relationships of Cerionidae within Panpulmonata. – Journal of Molluscan Studies: 1–9 (advance access doi:10.1093/mollus/eyw017). This entry was posted in Uncategorized and tagged cerionidae, literature, phylogenetics on July 25, 2016 by bramb.